Mahwish Bano BDS, MPH, Assistant Professor, Community Dentistry, Baqai Dental College. Sidra Azam, BDS, House surgeon, Baqai Dental College. Raza Abbas BDS, MPH, Assistant Professor, Community Dentistry, Baqai Dental College. The aim of the present study was to investigate whether there was an association between obesity and periodontal condition in patients aged 11-89years. 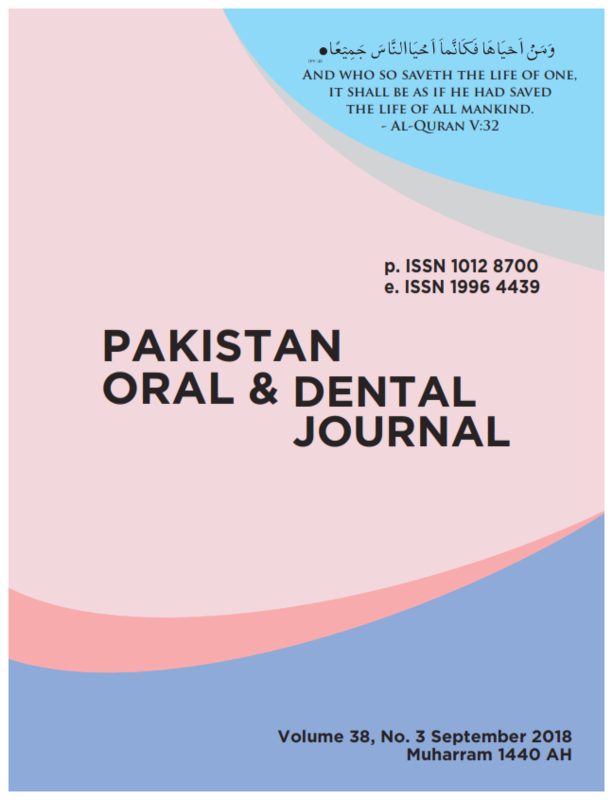 A cross-sectional hospital based study was carried out in patients who visited the Out Patient Department of Jinnah Dental Hospital. Written informed consent was taken. Convenience sampling technique was used. 192 patients of both genders were included in the study irrespective of their educational level and social economic status, the subjects with any systemic diseases and deleterious habits were excluded. Data were analyzed by SPSS 20 version. Statistical analysis was performed by Chi-square test. The values were considered statistically significant when P < 0.05. Out of 192 participants, 39 responders belonged to low socioeconomic status, 128 participants belonged to middle socioeconomic status and 25 individuals were from high socioeconomic status. According to gingival index 24 % participants had normal gingiva, but 45.3% individuals suffering from mild inflammation. On the other hand 22.4 % responders were suffering from moderate inflammation and 8.3 % participants having severe inflammation. According to plaque index, 21.9% participants did not have plaque, 45.8% patients had mild accumulation of plaque, 23.4% had moderate accumulation however 8.9% patients should abundance of it. In this study significant relationship was found between periodontal disease and socioeconomic status as well as educational levels. Healthy nutrition and adequate physical activity likely to reduce risk of developing obesity.